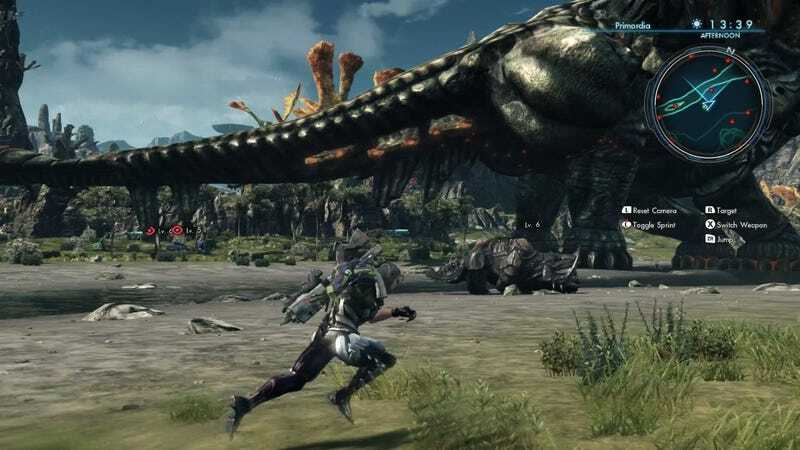 The huge new Wii U JRPG Xenoblade Chronicles X seems like it wants about 80 hours of my life. I’ve given it 18 so far, and I’m going to give it some more. I’m not really a JRPG guy, mind you. I love the Fire Emblems, but don’t really care about many Final Fantasys. I’ll take a Mario & Luigi over a Super Mario RPG (scandal!). But I did spend 65 happy hours on Suikoden V and think maybe it’s time for me to give a new one a go. It’s not just that. The text in the game is so tiny and the Wii U’s GamePad screen is so low-resolution, that playing the game on the Nintendo console’s controller display is possible only for those who don’t like to read. Hell, Nintendo has issued 11GB worth of downloadable data packs to speed up the game’s loading because, I guess, the system can’t pull data off the disc fast enough. I also barely care about the game’s characters and am not getting a whole lot out of the story yet. Good concept—humanity flees aliens fighting over Earth, crash lands on the planet Mira, lives in a bubble city while scavenging the wilderness—but the characters and plot events haven’t grabbed me yet. Wait, this has been a lot of negativity for a game that I just said I’m happy to stick with. Why in the world am I playing this? And can I knock a game for being so silly that they throw in a version of LA on an alien planet? What I’m getting from this game is a huge, beautiful world to explore and a pretty good combat system. ...but it works pretty well. Your main character auto-attacks and you jockey through your special Art skills and trigger the right color-coded ones any time your allies ask for help. Do it right, and it kicks in extra bonuses. Once you get it under your fingers, battles achieve a satisfying rhythm. Your party members shout encouragement. You buff one another, become more mighty, and crush some giant beasts. I like it. I do find myself, though, slowly climbing this mountain, slowly getting my bearings, and liking so much of the breathtaking things I see. I might still lose interest before I hit that 80 hour mark; I might decide life is too short. But I also might soon get a mech for my lead character and decide this game is even cooler than I thought. I might eventually not hate the cutesy companion character Tatsu, who runs around with my party. I might have fulfilling meetings with dozens more of this game’s constellation of characters. And my character might eventually become powerful enough to take down that brontosaurus-looking alien and call it a day. I usually turn to Nintendo-published games for polished excellence. Xenoblade Chronicles X ain’t polished. It is, however, a sight to behold and, rarity of rarities, a JRPG that might yet get me well and truly hooked. If you’ve got a Wii U, I’d say you should consider it. For another take, read the Xenoblade Chronicles X review by our friends over at Kotaku UK.